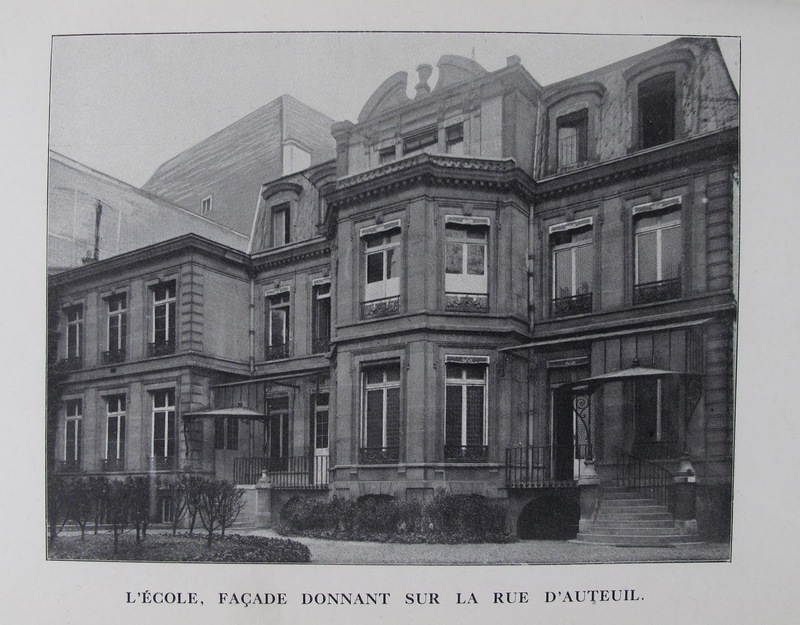 There are no surviving pictures of Madame Helvétius's house, then 24 Grande rue d’Auteuil, a country property nestling close to the Bois de Bologne between the royal Château of Coq (now demolished) and the village of Auteuil. The immense estate of the comtesse du Boufflers - now the exclusive Villa Montmorency compound, home to politicians and film stars - was just over the way. The property was described in the deeds of sale as consisting of the house, which bordered the road, and a small pavilion, situated at the bottom of a park of two arpents in length. (An "arpent" was 78 yards, so, depending on width, we are envisaging an acre or two). Built in about 1720, the main body of the house was flanked by two straight wings and included an elegant peristyle. A pretty iron gate led onto a courtyard containing a well and aviaries for Madame's many birds. Antoine Guillois, writing in 1894, gives a detailed description of the interior culled from the memoirs of Ambroise Firmin-Didot and other local residents who were children at the time. Visitors entering by the coach entrance, found themselves on the ground floor where there was a kitchen, larder and greenhouse and a bathroom with a window onto the road. On the first floor, reached via a fine wrought iron staircase, was a spacious dining room with views onto both the road and courtyard, a grand salon which could accommodate up to fifty people, and two smaller reception rooms. Guillois's youthful observers seemed to have been oddly preoccupied with details of furnishings - in the dining room: oak sideboard, table and side tables, five cane armchairs, chair covered with tapestry, gilded console and a marble basin mounted on the wall; in the mirrored salon: chiffonier with marble top, tables, settees with feather cushions and a whole assortment of other chairs and sofas upholstered in blue and white, plus a daybed with a blue damask cover; on the fireplace an enormous display of flowers in a blue porcelain bowl. Across from the salon, the mistress's bedroom boasted more fine quality furniture and hangings of blue velvet and taffeta. French window gave out onto the terrace which commanded a view of the garden and which was shaded by a magnificent acacia with profuse blossom. It was here every morning that Madame would come to feed the birds. Rhododendrons, hortensias, roses and other plants flourished under the care of her chief gardener Richard. The pavilion in which La Roche and Cabanis lodged was approached by an avenue of lime trees and consisted of two bedrooms, a dining room and kitchen plus a salon with a central dome. There was also a small vegetable garden where the various children who frequented the house were given their own little plots to tend. Franklin relics from the Historical Society of Pennsylvania. 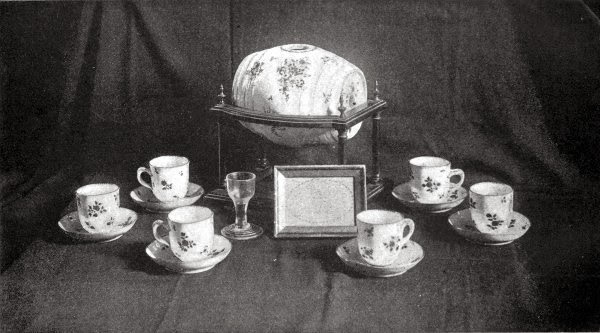 The Dresden china cups and saucers were a present from Madame Helvetius. According to Guillois, Madame's linen and tablewhere were those of a "modest bourgeoise"
In the dying years of the Ancien Régime, the void at Auteuil left by Franklin's departure was filled by a new generation of habitués, the poet Antoine Roucher, author of a vast and almost unreadable poem The Months, André Chenier, an intimate friend of Cabanis, Volney, the liberal nobles Destutt de Tracy and Eymar, and Condorcet, who in early 1789 brought his young wife to be presented to Madame. These men greeted the bright dawn of Revolution with uniform enthusiasm, with the exception only of the abbé Morellet, who, as a consequence, broke with Cabanis and La Roche and moved out with his furniture to a house in the valley of Montmorency at Cernay. Volney, Sieyès, Chamfort and La Chaise, the deputy for Brivé, now took up almost permanent residence. Cabanis, arriving from Paris on 15th July, was introduced to Mirabeau and became his close collaborator. In the Revolution's first years of liberal promise, the gentle abbé La Roche, true to his antique exemplars, abandoned his leisured life of book collecting to enter the public arena. He was elected mayor of Auteuil ("the fat Mayor" quipped Cabanis) and later, though never having exercised ecclesiastical functions, took on the role of constitutional priest to protect the refractory incumbant and his flock. 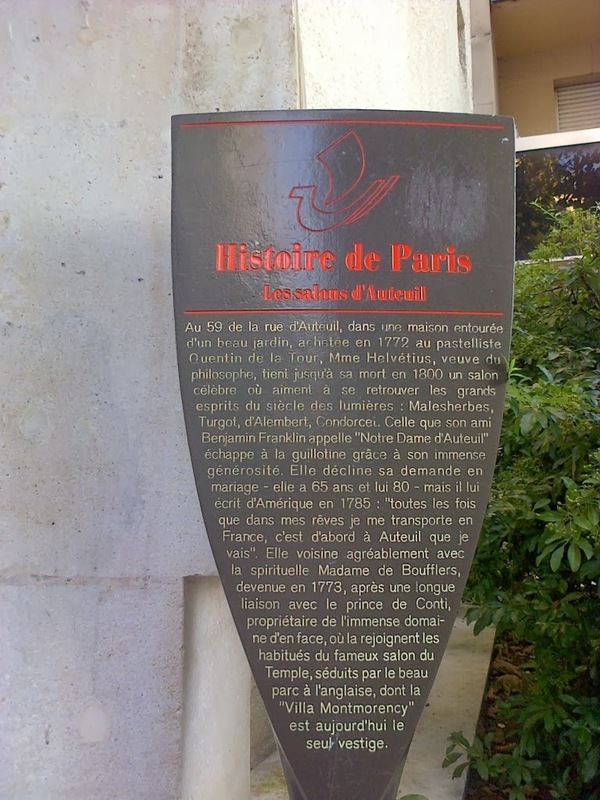 Both he and Cabanis featured prominently in a civic festival at Auteuil on 3 July 1791 in which a stone from the Bastille was installed in the Church (in which Madame's property entitled her to a private pew). It was La Roche who pronounced the opening discourse inviting the inhabitants of the village to "live as brothers and remain united to resist the chains of slavery." A year later, on 5 August 1792, a second fête inaugurated, on a piece of ground next to Madame Helvétius's house, a new Town Hall in the style of a Grecian temple, containing busts of Rousseau, Voltaire, Franklin, Helvétius himself and Mirabeau. In the list of patriotic contributions Madame pledged 4,500 livres; Cabanis 1,200 and La Roche 900. André Chenier meanwhile saw his play Charles IX performed to acclaim before an audience which included Mirabeau, Danton, Desmoulins and Fabre d'Eglantine. Cabanis attended the dying Mirabeau as his physician but still returned faithfully to Madame Helvétius, herself ill and anxious if he was absent. He and La Roche now allied themselves closely with Condorcet, who in September 1792 established himself nearby at 2 Grande rue. The Terror brought proscription and arrest. Roucher was imprisoned, as were Chamfort, Ginguené and Volney, and Condorcet was forced into hiding. In Auteuil itself Destutt de Tracy and the abbé La Roche were both detained, La Roche arrested in November 1793 and held first in the Abbaye, then in the Carmes prison and released only after the death of Robespierre. 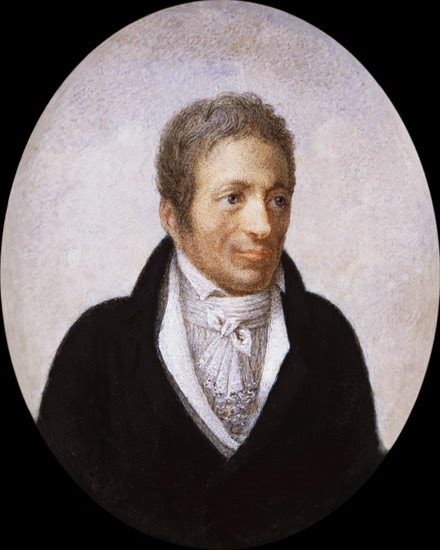 D'Andlau, Madame Helvétius's son-in-law, was briefly arrested and subsequently emigrated, although her daughters were protected, declared daughters of the Nation, in memory of their father. Although personally safe, the elderly lady was deeply affected by events of the Terror and talked constantly of her friends that had disappeared and that she hoped to see again. On one occasion, obliged to go to Paris to visit her daughter who was sick, she fainted on the Place de la Revolution. Cabanis dedicated his Mélanges de littérature to her, composed, he said, to distract her from the mournful preoccupations left by the terrible experience of the Revolution. At the height of the Terror, she had apparently hidden a considerable amount of money in the park, but forgotten its whereabouts. The sale deeds carried a clause stipulating what to do if it was ever recovered (which it never was). After Thermidor the life of the salon recovered, and its surviving members - Destutt de Tracy, Cabanis, Volney, Garat, Ginguené, Daunou - formed the core of the so-called "Idéologues", leading lights in the reconstruction of intellectual institutions under the Directory and Empire. In May 1795 Cabanis married Charlotte-Felicité de Grouchy, sister of Madame Condorcet and the couple came to live in the pavillion. Bonaparte himself visited and commented on the smallness of the park, to which Madame Helvétius famously replied, "You cannot know General, how much happiness is to be found in three arpents of land". 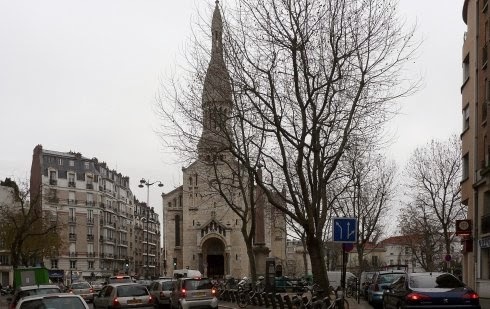 "Notre Dame d'Auteuil" died on 13th August 1800 at the age of 81. She had retained her habit of rising early and had contracted a chest infection at the end of winter, which neither Cabanis nor his colleague Pierre de Roussel could cure. In her final days, she had with her Cabanis, his wife and two daughters, La Roche and Jean-Antoine-Cauvin Gallois, the Tribune and friend of Cabanis, who had lived with her since 1793. According to her wishes she was buried at the end of her park in a vault constructed on the right side of the pavillon. Helen Maria Williams recalled that "she always spoke with calmness of death, and pointed out to me the spot in her garden where her remains were to be deposited". 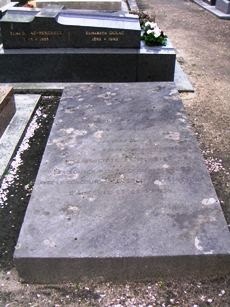 Her burial, without formal religious ceremony, is described by her grandson Jean-Antoine-Claude-Adrien de Mun in a letter to Mme de Staël, dated 31st August 1800; he mentions neither the vault nor the the pavillion, but confirms that the coffin was placed in a tomb dug in her garden in accordance with her wishes. Although she left the property to her granddaughters Madame willed enjoyment of the house to Cabanis and La Roche in the hope that they would continue to live there and watch over her ashes. This was not to be. The latter, a member of the corps législatif since 1799 retired to Orville in the Pas-de-Calais in 1803 where he died in 1806. Cabanis unexpectedly died in May 1808, his body transported to the Pantheon but his heart buried in the garden next to Madame Helvétius. In 1817, when the property left the family definitively, her remains were transferred to the nearby cemetery. After a first monument was destroyed in the bombardment of 1871, it was not until 1892 that a replacement tombstone was finally erected by public subscription. "Drama of 59 rue d'Auteuil"
The property was rented from 1808 by Sir Benjamin Thompson, Count Rumford, the American-born physicist, who had married Lavoisier's widow. 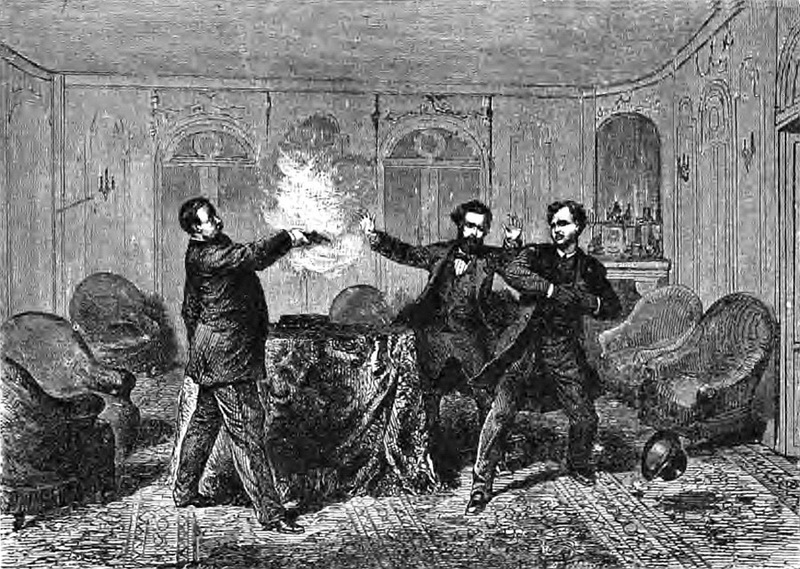 It then changed hands several times before being bought in 1854 by Prince Pierre-Napoléon Bonaparte, whose father Lucien Bonaparte had once frequented Madame's salon; the "drama of 59 rue d'Auteuil" brought brief notoriety when Bonaparte was challenged to a duel and, refusing, short dead his opponent's emissary. During the Commune the Fédérés briefly established a headquarters in the house but, learning that it had belonged to Bonaparte, decided to burn it down instead. In July 1877 the small pavilion used by Morellet and Cabanis was also demolished. In latter times the site was occupied by the École Normale Israelite Orientale. M. Guillois was the great-grandson of Antoine Roucher and seems to be the main source of factual information on day-to-day life chez Madame Helvétius. 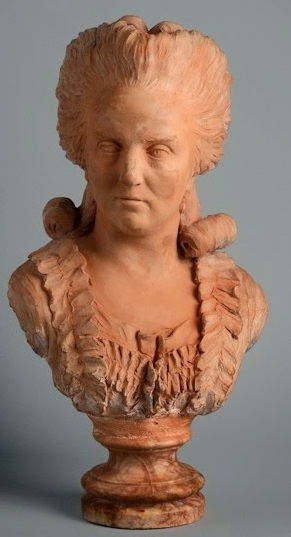 I recently came across this anonymous terracotta bust of Mme Helvétius. 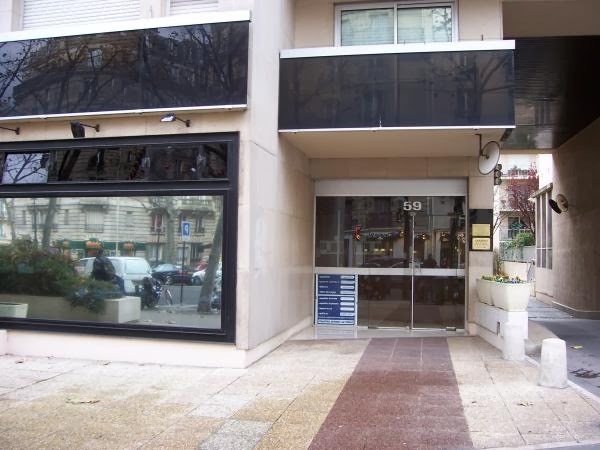 It was Lot 48 in the sale of the Collection Paul Rousseau held in Toulon on 24 March 2012.